This is an update to the post about the floor plan of this house written in August, 2010. Last week I realized that the builder of this cottage would probably have used the same kind of geometry for the elevations that he used for the floor plan. This is an obvious observation. Really! Makes me roll my eyes to know that it only took me 3 years to figure this out! It is clear from the photograph that the house has been expanded over the years. The siding was 'updated' about 40 years ago. 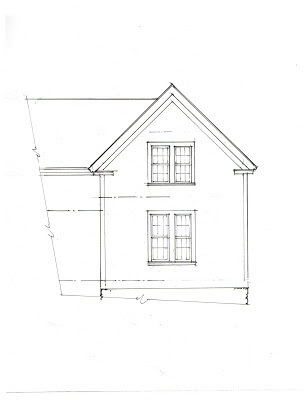 My diagrams refer only to the part of the house under the gable, to the right. The floor plan is shown with the complete daisy wheel for reference. 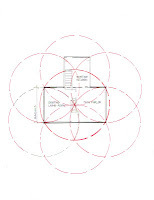 The main rectangle of the house plan is determined by where 4 petals of the daisy touch the circle; the wing's size determined by the arcs of 2 of the outer circles. This is a straight forward use of circle geometry. The elevations use a slightly different pattern. The upper diagram shows 2 circles intersecting - the outside of each touches the center of the other. 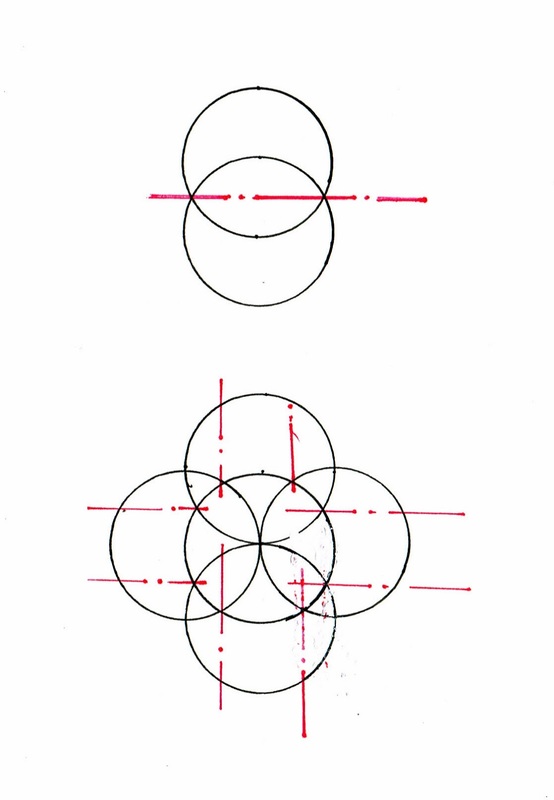 The place where the circles overlap is called a vesica piscis ('fish bladder' in Latin). The red line bisects the vesica piscis. The lower diagram shows one circle with 4 circles intersecting it, creating 4 intersecting vesicae piscis. The red lines are only partially shown for clarity. 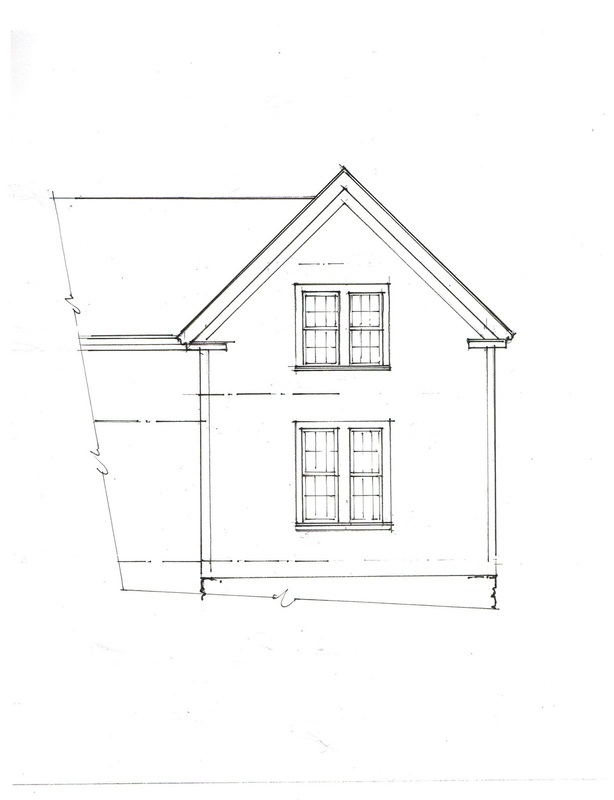 The diagrams show how the shape and dimensions of the elevation were determined. 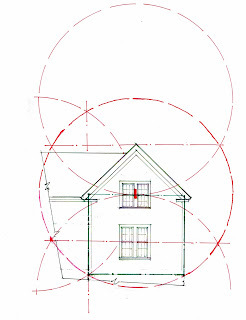 On the elevation the circle is the same size as that used for the floor plan. Its radius is the length of the wall. It surrounds the house. Its center is the fat red line between the second floor windows. The upper circle is drawn in full, but only part of the lower circle is shown. The lines through the vesicae piscis determine the peak of the roof, the center of the first floor windows. I have drawn only part of one of the circles on the sides, the left one. The vesica piscis there follows the wall of the house. 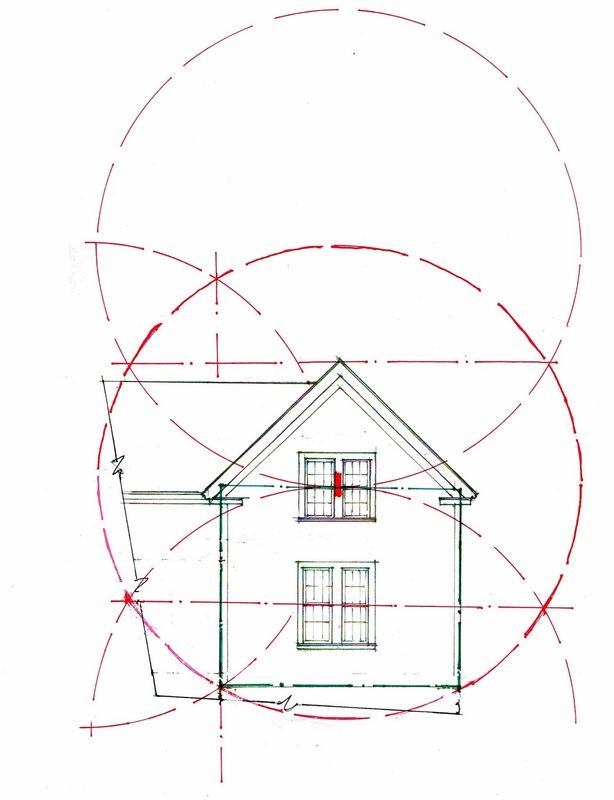 Note that the center of the main circle not only positions the 2nd floor windows but also marks the square of the wall, the top of which is where the builder will set his rafters.The square is outlined in green. 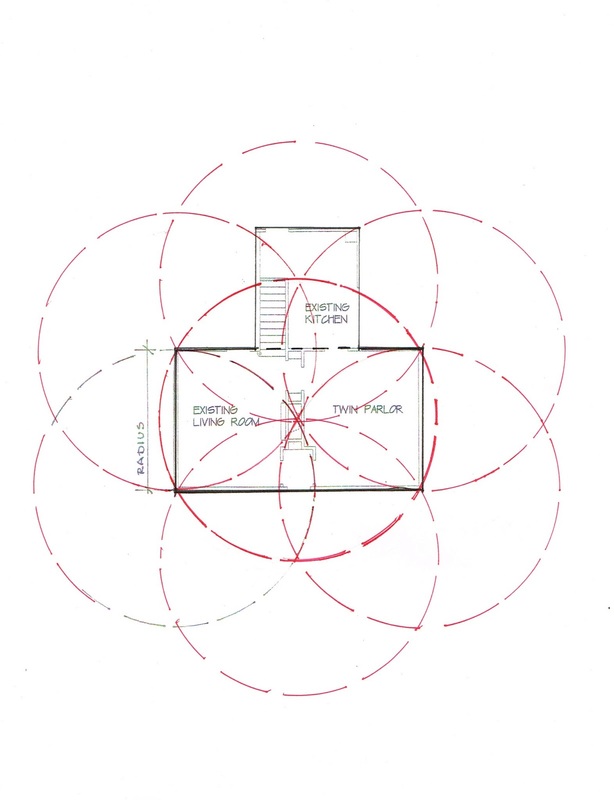 The circle which determined the floor plan, its dimensions, is also used to determine dimensions of the elevations. What is the circa date? Do you have the actual dimensions? Have read "The Power of Limits" by Doczi? I'm glad you like the post. I am amazed at what I find and delighted that someone else likes it. Circa 1830 given by the owner - I haven't done deed research. Stylistically that seems about right. I have measured the house. The dimensions are accurate. Interesting concept. Do you think this technique is still used in modern home design or has it passed? Jason, I use it when I work on old houses. But I do not hear about it from others. When I was in school I asked the visiting architects about 'regulating lines'. They told me privately they used them - mostly the Golden Section. However, it was seen as 'magic' so they didn't mention it in lectures. I think as the builder and architect became 2 separate people the knowledge and use of geometry stopped being passed down. Did you ever learn it? Your house is 3 bays wide and its height is divided in half. Your windows and porch post, etc. fit into that basic geometry. ha! I can't edit my comment! Jason: When I look at a house like yours, 100 years old, 'updated' c. 1970, I think about its original geometry which gave the house presence and style. It's still there, just hidden. That character can be made visible again by bringing back the parts that were eliminated: its lintel over the porch, its corner boards and window casings,frieze, the lines that show us the rhythms. It's ethereal, just light and shadow, but it matters!